“What the heck is figgy pudding and why won’t they leave until they get some? !” This is the question my husband asked me as we were together in the the car listening to the radio playing “We Wish You a Merry Christmas.” I just looked at Kent and said, “I don’t know what it is but, I bet it is delicious if people are staying until they eat some of it!” Right?! a fruit cake more then anything, it’s full of nuts, citrus, spices and dried figs of course. Well, I hate to say it, but if Kent was to be served this dessert at someone’s house he would gladly leave; he hates nuts! He would not be begging the host to stay, he would be begging me to leave! 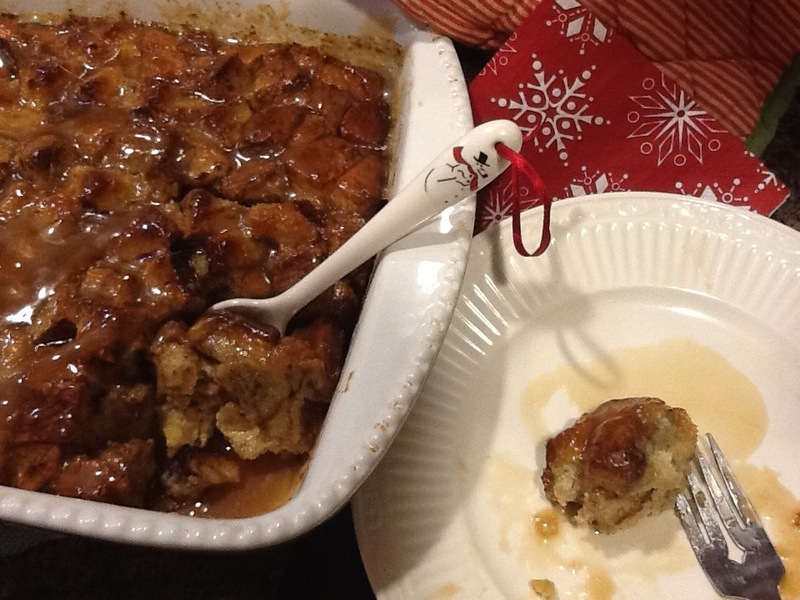 So, after all this research and talk about what I thought would be more like a bread pudding has left me craving for some buttery, rich, custardy bread pudding! And, I left all dried fruits out! Not even a raisin touch my bread pudding. Oh goodness….the sauce that goes on top is worth burning your tongue if you might be a little impatient to try it! 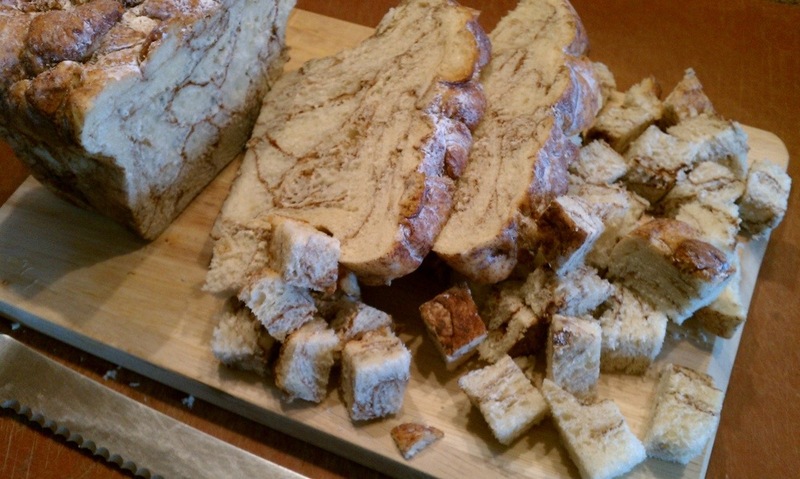 Start with either a homemade loaf of cinnamon bread or a loaf bought from the bakery. Or, you could do what Nellie does; she uses leftover cinnamon rolls. Yum! Dice up in large cubes, then lay on a cookie sheet and let it dry out. You need it to be stale so the bread will soak up the custard mixture better. Make your custard. I was short 1 cup of half & half so I used eggnog. Turned out so good! 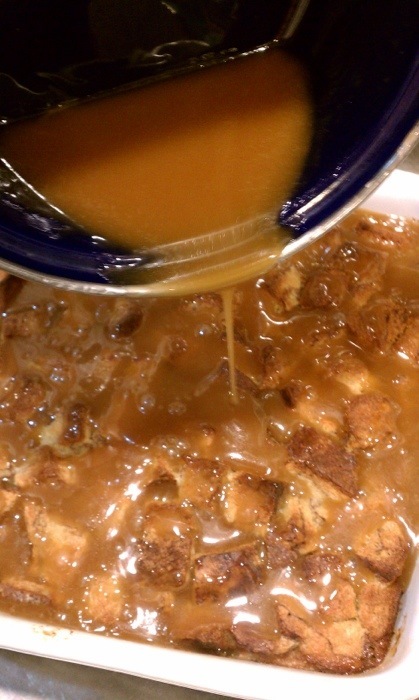 Pour the custard over the stale bread cubes in a prepared dish. Let the bread soak up the liquid for at least 15 minutes before baking. While the bread pudding is baking, start preparing the topping. This bread pudding can be made with raisins, dried cranberries or even dark chocolate chunks. I opted for just plain yet delicious. I truly just wanted the sauce, but after taking my first bite with the bread pudding I thought this is a marriage made in Heaven! And, this is defiantly a dessert people will be waiting for! Bye, bye, figgy pudding! Grease a 2-quart rectangular (12×7-1/2×2-inch) baking dish. Add bread pudding mixture, spreading evenly. In a small saucepan, heat packed brown sugar and butter until butter melts. 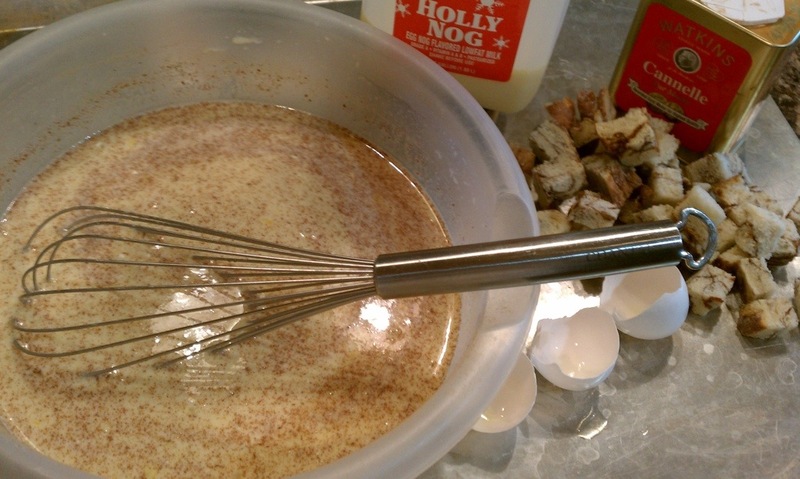 Carefully add light-colored corn syrup and half-and-half or light cream. Cook, stirring constantly, over medium-low heat for 1 to 2 minutes or until sugar is dissolved and mixture is smooth. 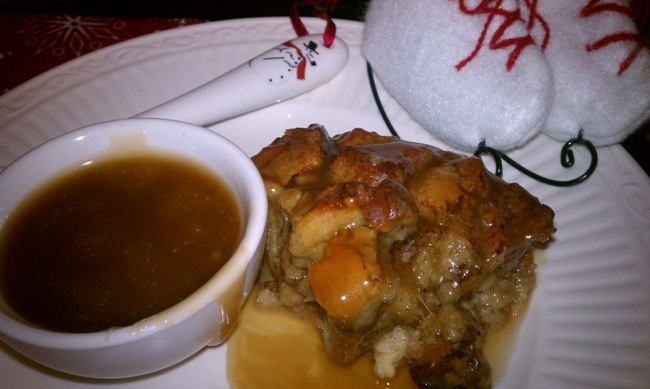 Pour over the warm bread pudding or serve on the side. Enjoy! Much better than a nut filled fruit cake. 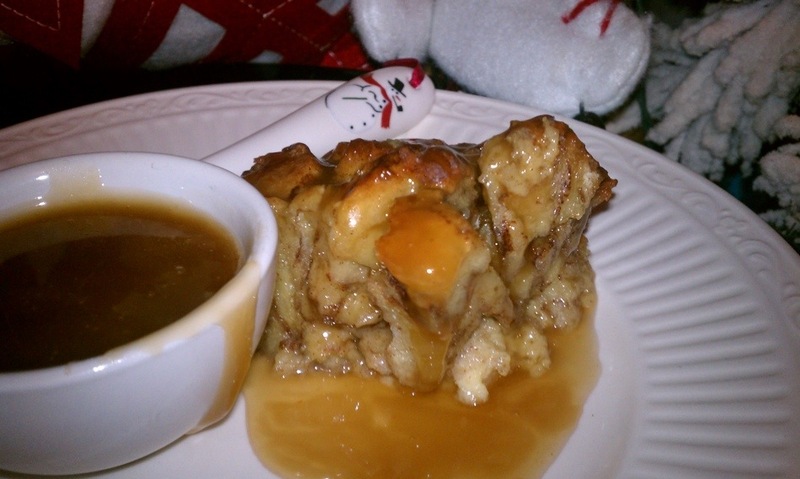 Yummo Tahny…love love love bread pudding!! I always call it the poor mans dessert!! But, I also love figgy pudding, or plum pudding as we call it! Actually that is another thing that my husband has to have, or it is not Christmas! We soak it in brandy and light it on fire and carry it into the dinning room for all to admire 🙂 Oh those crazy Brits/Canadians!! !